Duck season or rabbit season? With our collection of mini hunting supplies, you can have either or both – all year long. We’ve got a full selection of gear to complete any hunt. 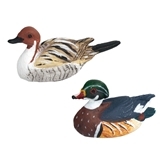 From rifles to decoys to cabinets, here at Miniatures we have it all. Our collection of doll guns is nothing to sneeze at. 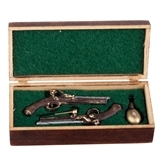 We have traditional rifles, double barrel shotguns, and even a beautifully-detailed case featuring a matching set of dueling pistols. 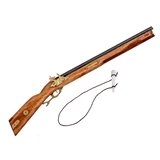 Take to the (miniature) woods with these guns, or display them in a lodge setting for an extra rustic touch. 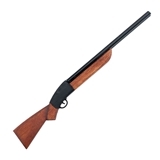 You can hang a shotgun behind the bar of any establishment that gets a little trouble. 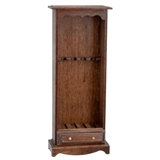 Or maybe you’ll want to stock the gun cabinet of a hunter’s home with a few well-loved rifles? With realistic details and gorgeous paint jobs, you’ll be hunting for a way to use these doll guns. 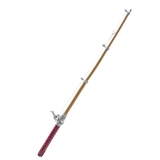 If you’re a patient kind of hunter, you may want to look at our mini fishing rod instead. It comes with its own line – so get ready to reel in a big one! (We may not have the sort of fish you want on the end of your line, but our animal miniatures category does have some koi fish and clownfish to fill up a pond!) 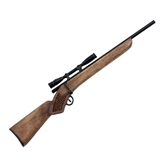 Whatever your pleasure, we’ve got the mini hunting gear for you. Take a look at our collection below!